It’s been a while, but for a time I was blogging music on Sourcerer. Maybe my most successful post – in part because it was open to so many suggestions and wasn’t focused on one artist – was about vocal duos in bands. It’s great and all when there’s just one person singing, but I really like it when you can get two people going, either separately on different songs, or together on one. Between writing that post, and getting Apple Music, I didn’t pick up too much new music – so it’s been an explosion of me finding and obsessing over new bands, and new material from bands I had one album for, ever since! And my jumping-off point has been this post, the idea of these sorts of bands. Several came up in that other post or in its comments, but let’s explore! Oh and I should note here… I haven’t really watched these music videos, so hopefully they’re not too weird? If we were having coffee, I’d ask you where the time went. We’ve reached the end of my time home with the Geek Baby. We’re traveling for Thanksgiving this coming week (look out for some great contributor material! ), and then the following week we’re working on transitioning into a home care situation. And it’s not like the Geek Baby is all grown up and saving China, but it’s still sad to be at the end of this time I’ve had. We’re of course super grateful that we’ve found somewhere at all for her to be watched – one of us staying home full time would not be at all economically easy. If we were having coffee, I would tell you there’s a lot that I thought I was going to be able to get done during these several months. I’ve talked about much of it before. Well, none of it really went well. For instance, there was my Warmachine Journeyman League. The League ended and… I was last place. Well, I guess second to last – there was someone who played one game. Some of it was most people played their most games the first week, and I missed the extra games session they were all at because I was working. After that, we played more points and the games were longer, and could play fewer in a week – so there was never a chance to catch up on games. Meanwhile, my starting army (chosen for me because it’s based on what they sell as the starting pack) was awful and I was losing all those games anyway… and winning later. Wasn’t enough to catch up at all. Then there was the Superhero Entertainments class that Holly and I were taking online. Yeah, that ended up not happening past week two for us. There’s another session in the future, so who knows, maybe we’ll take it yet. Interesting – but finding the time to watch, take notes, visit the forums, do the quizzes… plus, watching stuff together it only counted as one of us watching stuff and they track that for completion, so we were going and having to basically have a device watch all the videos for us a second time. Speaking of classes, there’s a class I’m doing online now as well for professional development that my work paid for. I’m at least off to an okay start there – though I’m going to have to do all of next week’s while traveling, pretty much. And I haven’t made it to the chat sessions yet as they’ve been the same time as doctor’s appointments for the Geek Baby. Then there’s the sketching NaNoWriMo I was working on. Well, it was off to an okay start. Sketches, anyway, not completed drawings like I was hoping. I’m realizing that’s a lot of process – and I see why professionally it’s done by many people, and why webcomics have a spaced out schedule. There’s a lot to it. And I eventually fell behind, discouraged, and stopped. I was playing Kingdom Hearts 2… Fell off the completionist wagon there, and moved on to a variety of things. TV, where I finished my long-haul re-watching of Star Trek: The Next Generation at least. Oh, and watched Firefly and Serenity again. Then back to games and played a little Diablo 3 with the expansion… and then Fallout 4 most recently. And not a lot of reading even happened, though I’m hoping for a bit of reading time as we travel. Along with doing classwork. And trying to maybe get something written for a university publication by December 1. Oh, and vacationing. If we were having coffee, I would fall into the cliche of having to say that watching a baby is a lot of work. We all know that as a haha, yep, that’s a thing sort of a fact… but in actual practice? Like, a LOT of work. TV and gaming tended to happen during naps, often with her asleep on me (or Holly, before me). We’ve kept the blog going, at least… but any growth plans, including stronger coordination with the contributors, has not happened. Sorry, contributors. If you have any blog post ideas, please, I’m all ears. Or, well, fingers and eyes on the computer, I guess? If we were having coffee, and thinking about contributors, I would point out that we haven’t been the only ones busy. Though I of course haven’t been doing much blog reading either, I am in touch with a number of other bloggers. Many are at the seasons in their life where their blogging plans are changing, or they are starting whole new blogs. Things have gone quiet over on Sourcerer. It’s like not just we have gotten really busy – everyone has. A lot of our peers and friends, people our age, are all starting to have kids as well. The Geek Baby is suddenly going to be just one of the oldest of a large group of kids. But that also means a likely change in the seasons of our life, as we move towards kiddo get-togethers and play days, things like that. Where did the time go? Do you know? Today is a re-blog. David and I both have a post running today on other blogs. This is the comics post I wrote and ran over on Sourcerer – and you can find David’s Passionate Geeks post over on Eclectic Alli: https://eclecticali.wordpress.com/2015/10/14/passionate-geeks-i-cant-stop-thinking-big-the-music-of-rush/ Hope you enjoy! 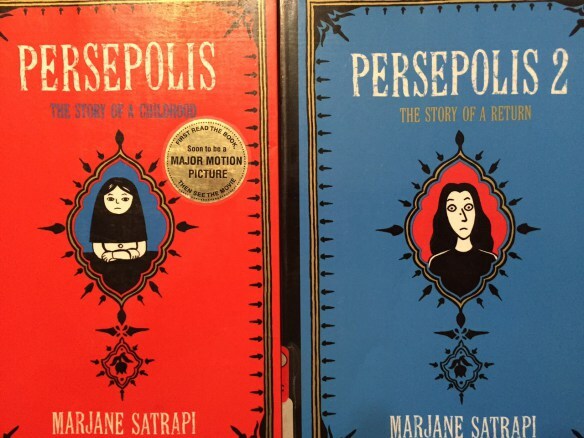 Persepolis is an autobiographical graphic novel by Marjane Satrapi. She grew up in Iran during the Islamic Revolution. When things seemed to get to rough she got sent away to Europe, but eventually came back home. It was also one of the top challenged books in America in 2014. Using a graphic novel to tell the story made it something that could cross boundaries in many ways. It is difficult to talk about a situation from another culture if you have not grown up in that situation. Visuals help to translate those cultural differences into something that can be interpreted by others. The story itself is so incredible and to see those items visually it really brings power to the story being told. Tagged Age of Ultron, Avengers, Hawkeye, Jarvis, Marvel, Marvel Cinematic Universe, Quicksilver, Scarlet Witch, Sourcerer, The Vision, Ultron, Where the Heck is Barton? This was our second year doing the A to Z Challenge. Last year, it easily worked within our existing posting schedule, as we were posting like that already – a post a day, 6 days a week. Since then, we decreased our schedule – we post now Monday-Thursday, with a shorter “fun” post on Friday. We’re back to that schedule now – but it meant more writing for us in April! We also successfully wrote all of the posts in advance (of their posting date at least), and that was really nice. We might just try to keep that up… we’ll see how that goes. Last year we went with one of our existing themes – Character Studies. That was a lot of fun, and got people talking. This year was also an existing theme, Science Fiction Today – and it got people talking in a whole different way. There were some really great examples people gave, and some really great, heavy-duty discussions. If you are interested in science fiction, politics, or the idea of the world as a better place… check out the posts you haven’t read from our challenge this year! Oh, and definitely also the comments. One thing I learned this year is that the first few days are the biggest. I wrote the first post for Sourcerer, and it was huge – as was the “B” post the next day. I recently got more likes for that one, it just keeps going! The “A” post here was an intimidating topic, so hopefully we didn’t scare too many people away. However, it also showed that we weren’t shying away from topics… and hopefully it was well done. People seemed to react positively to it, and had some good ideas in the comments. Oh, and one last thing… if you’re looking for more A to Z fun, check out the party over on Victim to Charm… the idea is, people shared their favorite posts from the challenge – lots of posts to check out in the comments there!